Staring at the graphs, criss-crossing lines and decimated numbers on trading platforms, Forex trading can be a little intimidating for newbies, at first. There are so many methods revised by forum pros every day, but you hardly understand those jargons. Fibonacci expansion, say what? However overwhelming these uncanny terms may appear, fortunately enough, you can start trading just by using simple and effective strategies that is as useful as any indicators in the market or on the trading platform (although overlooked often by many), which is trading with Support and Resistance levels. Before entering the market, traders recognize the types of market trend, whether it is a bearish or a bullish one. These trends are supported by zones, that are sometimes difficult to break through. These are the Support and Resistance zones. A Support zone is the lowest point reached before the market price bounces back up. A Resistance zone on the other hand, is the highest point reached before the market price pulls back. When a price passes through a Resistance zone, the Resistance can become a support. And when a price passes through a Support zone, the Support can become a Resistance. The more often a Support or Resistance zone is price-tested, the stronger the area will be. It is important to always remember that Support and Resistance levels are NOT fixated on the numbers, but we’d rather take them as areas, or zones, where the price movements are very active. Sometimes we notice the market price going towards our favor (breaking a support/resistance level), however shortly afterwards it retracts and goes off in an opposite direction. This is a false breakout, where traders pumped many dollars just to test the market. If you have bought into this position, you could be losing out on this game. To filter false breakouts, plot support and resistance zones on a line chart. Candlesticks are very useful, no doubt, because they show the highs and lows of the market price. However many times, these his-and-lows are just ‘knee-jerk‘ reactions from the market. That is to say, there is no apparent reason behind these impulses (probably just testing the waters), so no one is going to apologize and patch up with what you have lost because of a jerk. So to avoid falling into these jerking price movements, line charts help to effectively filter out the his-and-lows to focus only on intentional trading movements. No oopsy-daisy. Trend lines are paths that connect 2 or more support/resistance levels. There are generally 3 types of trend lines. 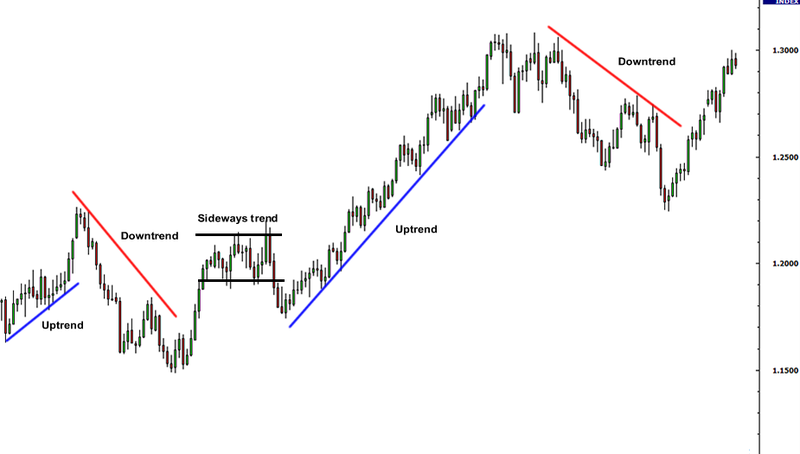 Uptrend: A line that travels along the bottom of identified supports or valleys. Downtrend: A line that travels along the top of identified resistance or peaks. Sideways trend: A line that ranges from left to right. It takes at least 2 tops or bottoms to draw a valid line. To confirm a trend line, it takes 3 tops or bottoms. The steeper the line, the less reliable it is and the more likely it is to break. Trend lines, like support/resistance zones, become stronger every time the price is tested. NEVER force the lines to fit the market! It has to be the other way round. Channels are like paved roads, that help you determine your next move, whether to enter a buy or a sell position. Generally, when price hits the bottom of an uptrend, you enter a buying position. When price hits the top of a downtrend, you may enter a selling position. 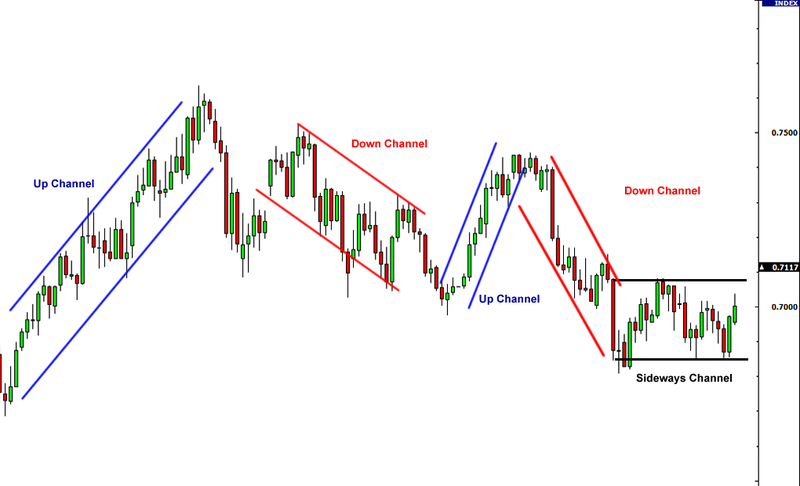 Both tops and bottoms of a channel can represent potential areas of support and resistance. Draw a parallel line in accordance to an uptrend. Move the parallel line to touch the peak. This line should be drawn at the same time the uptrend is created. Draw a parallel line in accordance to a downtrend. Move the parallel line to touch the valley. This line should be drawn at the same time the downtrend is created. Draw a parallel line in accordance to a side way trend. Place each line at the peak and valley respectively. Two lines of the same channel MUST be parallel. Generally, the bottom of a channel is a buy zone, and the top of a channel is a sell zone. NEVER force the price to fit channels that you draw. Channel boundaries that slope at two different angles is a mistake and may lead to a bad trade. And yes, finally we’re going to apply the techniques we’ve learned thus far into practice trading. 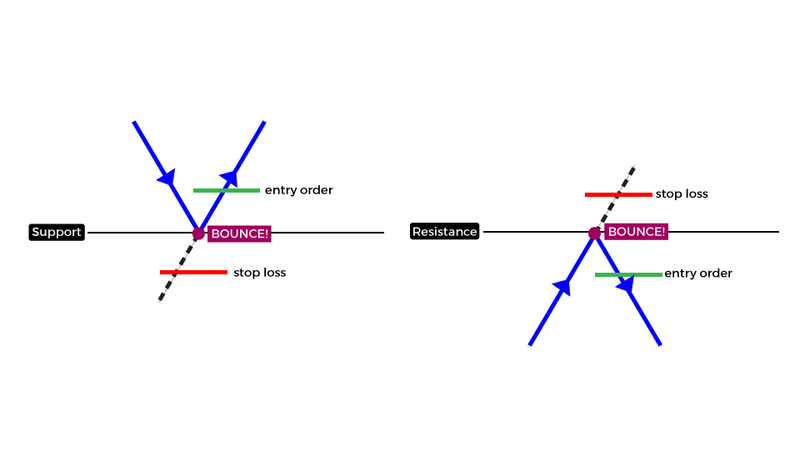 To trade with support and resistance levels, first we must understand the intention behind a price movement and how to enter the market using Bounce and Break strategies. As the name suggests, bouncing is to set an entry position just slightly below a resistance or above a support level. A bounce helps traders to confirm the upcoming trend lines. Why wait for a bounce, if I can set the entry point on the support/resistance level to yield maximum profit? 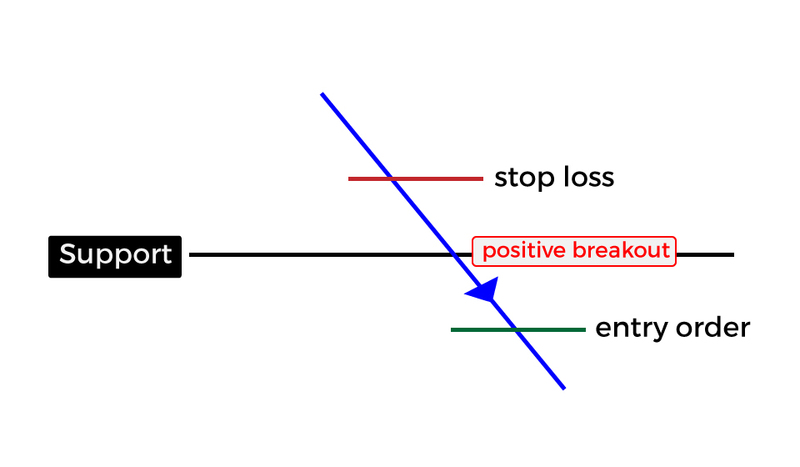 The problem with setting an entry point directly on the support/resistance level is that, you are betting on both losses and profits, since the market direction is not confirmed, and may reverse to quickly leave a trader in an opposite direction. So instead of buying off the bat, wait for a confirmed uptrend/downtrend movement before entering an order. Note that the price movements through support/resistance levels are very fast. If the odds do not play in your favor, trying to catch a falling knife can be really bloody at times. 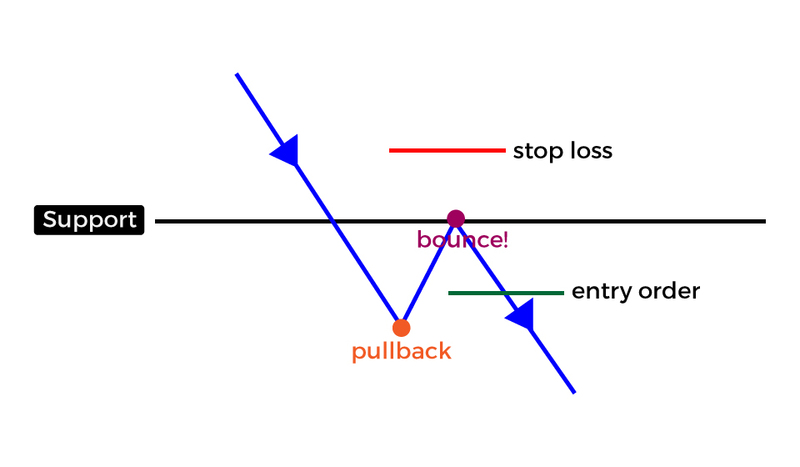 Trading with a bounce helps prevent a scene as such. 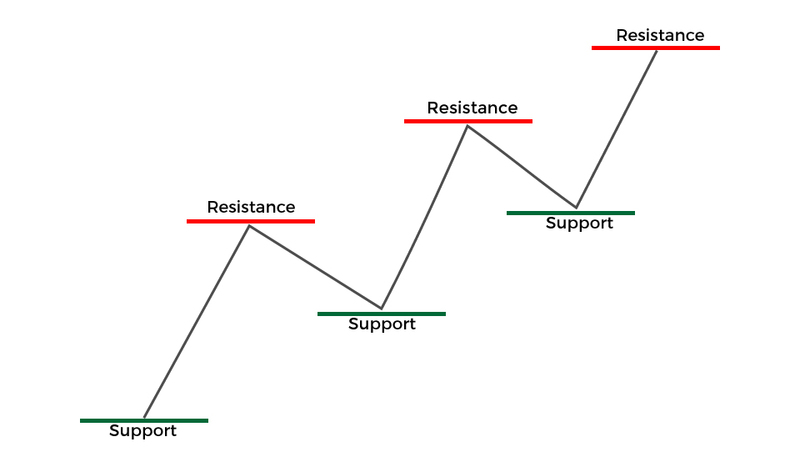 When a resistance level is broken, it can become a support. And when a support level is broken, otherwise can manifest. In the Forex market, support and resistance zones break way toooooo often. How should we play this game then, when the levels are broken? Tackling breakouts using an aggressive method is very straightforward. Generally, you buy/sell when prices strike through support/resistance levels. This method is useful when you have just lost an aggressive trade. Some people accept defeat and sell off their position immediately to prevent further losses. A conservative however, is like a hunter that preys on chances. With good faith, he sets his eyes on an upcoming pullback, waits for the right opportunity and enters to market after the price bounces back on track. It is very important to note that, however hopeful you feel during a trade, pullbacks don’t happen everyday. And the market will coldly leave a trader behind. So NEVER rely solely on good faith, and make good use of stop loss function. Imagine trading Forex and losing profits due to frequent downtime, inconsistent internet speed and/or bad connection, even supercomputers with the best trading algorithm cannot make do without a robust server. Starting from only RM2.13 per day, you can now enjoy the best server specifications and configurations in Malaysia, on top of a group of supportive customer service available 24/7.